I ordered a flat of snapdragons again this year for a junior rowing fundraiser. Some of last year’s plants are still alive because of the mild winter (as shown in a late November post), but they’re not blooming yet, so it will be good to get some new ones in next to them! The plants were delivered to the boathouse this afternoon, and my husband picked them up. He hasn’t gotten home yet, and the flowers are still in his car, so I’m posting an image that I cropped from the order sheet instead of the actual flowers. Tomorrow afternoon I’ll get them planted while my husband mows the lawn. Wishing all my readers in the Northern Hemisphere a week of happy spring planting too! I love this little ones, a park close by has many of them, I was admiring their beauty few day ago. Happy gardening to you! Thanks Elizabeth, a happy week to you also! 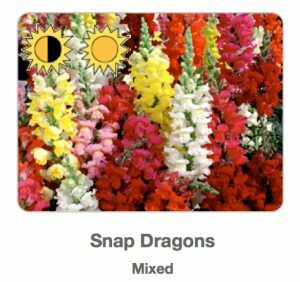 Always loved snapdragons! Unfortunately I DO NOT have a green thumb when it comes to flowers and plants! My Mom has a very green thumb tho and we always had flowers everywhere 🙂 Happy planting to you! I do not see snapdragons very often — but I always like the sound of their name in descriptions in books and “spring flower talk”! I planted some daylilies, purple cone flowers and caladiums for the summer. I am trusting with my intention — that they will grow!! 🙂 Thank you for sharing with Nurturing Thursday! Yes, new life everywhere! ?